What would I do without all of you? I am in awe that anyone reads my ramblings, much less take time out of their busy days to share ideas and give advice. Thanks for all of the AMAZING ideas for boy's birthday presents. I am actually excited for the first time to go to a non-pink party. Heather Kate left me a link to her favorite Martha green. For some reason my Lowe's didn't have this paint chip, so I would have never known it existed. This morning Lulu and I swung by the paint department and had them mix up a little sample. (I may or may not have gotten a few more paint chips...) I love how it goes with my future ambitious quilt and fabric that I dream about. I painted a little area of the room and am smitten. In every light it is just perfect. The similarity to my old green is amazing. I was seriously considering going over there, knocking on the door and asking to cut a piece of drywall... do you think they would have said yes? I bet they have repainted it! Probably white or something boring and sad. It is time for the Island Surf bedroom to change. Part of me will miss these waves. I painted them when Halley was one week old. Things change quickly around here. I bore easily, and 4 1/2 years is a really long time for me to commit to a decorating scheme. I have been sewing like a madwoman. Purses are on my list for the boutiques and I have 4 sewn, 26 to go. Crazy. Anyway, I had been eyeing this zebra goodness for some time, and would constantly check if it was sold. (Visit Mollie By Design to see more. )I came to the conclusion that I could treat myself to it in exchange for the zillion miles I am stitching each day. It came today and I am in love. 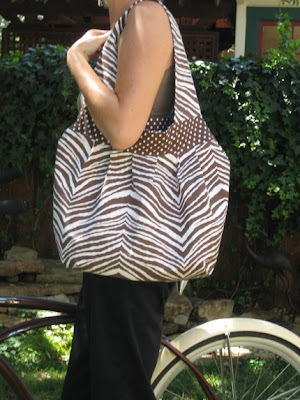 I used up most of my zebra fabrics on the crates and who doesn't need a wild purse once in a while. It will distract from the dark circles under my eyes and my two inches of brown roots. Ooohhh....what a FUN shade of green! Oh how I LOVE LOVE LOVE color!! I have left my mark on most of the walls in our home with some fun shade!! That green is so happy and bright! How will your girls wake up and NOT be in a good mood?! I mean, really?!! Now you realize, you must show the finished product and then a peek into the nursery as well, right?!! The zebra bag is cute! I had seen it on your side bar of faves. YAY for you for ordering something fun for yourself! i love the green and i love the purse. good for you to treat yourself. we mamas need that once in awhile. 4 and a half years is way to long to commit to a color! I love that green!! I may have to repaint, too. It's been two years over here and mama's bored.